Ireland returns to the bond markets by the end of this year, yet billions will be taken out of its economy under the recently announced Budget 2014. 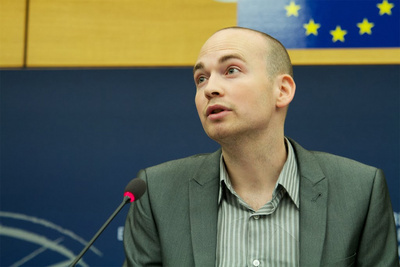 Paul Murphy MEP believes that the debt is becoming non-payable, so the solution is its repudiation. “If we refuse to pay then there is no deficit, but a slight surplus. The austerity is purely imposed to pay the bond holders,” claims Paul. This is the 7τη austerity budget according to Paul and the government is hitting the most vulnerable again, young people in particular. “You just can’t remove millions out of healthcare without having any account. They are trying to talk about recovery but there isn’t any,” Paul continues. The Irish Government claims a 4% growth of GDP but we have a 4.3% GMP decline and prior to that we had ¾ of GDP decline. “At best the economy is really sagging,” he states. “They are trying to create this idea that by returning to the markets, we are a big success story. But it is very likely that we will take a precautionary credit line with the European Stability Mechanism, which is essentially a second bail out”. It will come with a conditionality, which means something like a memorandum of understanding, more austerity, supervision and visits by the ESM people, not the Troika. “A change of overseer but the facts do not change,” he states. “The most important question is if the € 200 billion national debt is payable,” Paul adds. Around € 65 billion comes directly from the banks. Another € 65 billion comes from deficits that have been built up over the period of the crisis. The debt is 125% of GDP and the projections of the EU Commission have it coming gradually down to 100% by 2020, but they’re based on growth rates of 3% over the next years. “The government is not going to meet these rates as we have extremely low rates of growth already this year”. “What we could do is a moratorium on debt repayments, a debt audit commission to investigate the debt,” Paul believes. Establish what is owed to private people, pension funds and pay them. “But we should not pay the debt which is owned to the ECB, big bond holders and the IMF”. “I am not trying to say that it is an easy solution; there are complications like engaging in a major struggle, particularly with the ECB,” says Paul. “In retaliation they will cut off funding from our banks”. “But I think the consequences of that are better, than paying the debt which is unsustainable and eventually we will not be able to pay,” he continues. The benefit that Ireland has is having a lot of ECB money now in its banks and they are state owned. “So we have a card that we can play,” Paul believes. Paul also disagrees with the way Ireland handled its banks. The decision that was taken by the Irish government was to nationalize them, but they did not take public ownership of them. In other words according to Paul, Ireland continued to run its banks as profit making enterprises. "We should have taken democratic control over it, nationalize them and refuse to pay the bond holders," says Paul. "This year, the bailed out banks will pay € 16 billion to the bond holders and the banks are fully funded to pay them. This money could be used to pay something else," he continues. Paul thinks that Ireland should not pay some of the bond holders and use the control of the banks to write down people’s mortgages, so they can have money to spend. The lack of credit is a massive drain in the economy and so the country needs to enable people to get access to it. "The banks keep saying that they are open for business but it is not real. It is so irritating that we own the banks but we do not use them as a policy tool," states Paul. He also thinks that an action must be taken on European level, as this crisis is a European wide phenomenon. Like the general strikes that were organized last November to some degree in Greece, Spain, Portugal Cyprus, Malta, and in Italy, with more or less success in different countries. What Paul and his party is putting forward, is the idea of a common industrial action initially across the countries of the European periphery and then across the continent. Paul also believes that the Seanad referendum in Ireland was lost because people distrust the political establishment in general and the government in particular. "People have a deep and correct sense that there is a power grab happening, that things are less and less democratic," he argues. And that is a phenomenon that happens across Europe. In Ireland this is obvious with the economic management council, which is the centralization of power. "That was the context of the Seanad referendum and in that context people saw the referendum as part of that power grab," Paul believes. "In my opinion it was a mistake, the referendum was about the government cynically trying to do something that would make things slightly more democratic. This actually contradicts them in policy, but people did not believe them and so they voted against the government's proposal," he describes. We ended the interview with Paul on a lighter not, as I asked him to describe life in the European Parliament. "It is very different every day,"ha stated. "On the negative side there is a lot of travel, stress and pressure, but on the positive side there is this amount of interesting people that I meet," he said. "In one day I can meet Palestinian candidates, Bangladeshi campaigners, or many very interesting and impressive people in one day. The only problem is that there is not enough time in my day, to follow with all that is happening," Paul continued. "I have the privilege to be able to travel and meet people in Turkey, or in other important developments like during the Gaza flotilla raid protests. I am aware of that privilege and I want to make sure that people across Europe get as much benefit from it," he concludes.